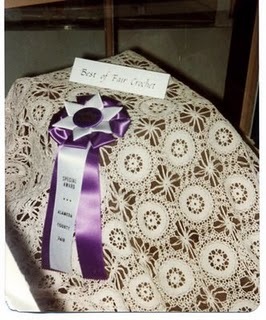 "Vintage Crocheted Tablecloth" ~ It's a Miracle! Well, at least for me it was a miracle! Back on February 25, 2009 you may remember (or not) that I did a Wordless Wednesday post of a tablecloth. At that time, and up until now it was the only tablecloth like it that I had ever seen. Let me share a bit of history regarding that tablecloth. Back in about 1978 or 1979 I found a beautiful crocheted tablecloth pattern which I decided to make. I had never made a tablecloth before, but I had crocheted a top from thread. I saw the top modeled on the front page of a magazine and fell in love with it. I taught myself to crochet making that top. It was beautiful, it had long bell lacy sleeves...not sure if I have that top any longer...in fact I made two of them, my girlfriend loved it so much, she wanted one. The 1920 Federal Census states this Westby family lived at house 100 and were family 101. "H" Westby is head of the house, 58 years old and a farmer. His wife,"Carrie" [sic] is 56 and does not have a trade or profession. The Westby's own their home and have a mortgage. Both were born in Norway as were each of their parents. "Jalmer" [sic] is next on this census. He is also listed as being head of the household and a farmer, at nineteen years old and single. He did not attend school, could read and write, and was born in Minnesota. As a matter of fact the rest of the family shown on this census living in this home did not attend school, could read and write, and were born in Minnesota. 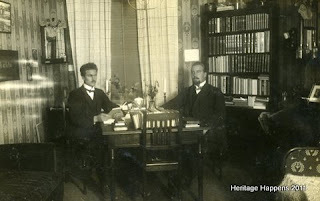 Picture postcard; unknown people, scanned from brown Lundberg/Sweden album. This is one of my favorite pictures of my mother's father and his wife. 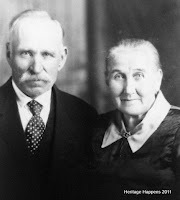 My grandparents were very special to me and I miss them very much. 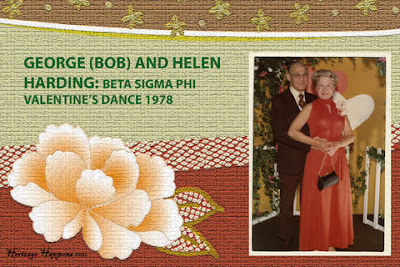 My grandmother was a member of the Beta Sigma Phi and she loved attending and participating in every function she could. She was very active and I know that is what kept her so young at heart. My grandfather was very supportive and participated in any and all functions grandma encountered. Enjoyment at everything they attended or held was always very obvious. They were a match made in heaven! What better day to share this event that they attended than Valentine's Day? This past weekend has been very interesting and busy for me! 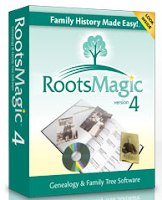 Friday morning started out with a free online Roots Magic class on Sources and Citations. This class couldn't have come at a better time for me, as I was planning on spending the weekend working on this very subject! Roots Magic's Bruce Buzbee did a fantastic job showing and explaining how to use the source and citations fields. I took almost three pages of notes and learned a lot about the program. Roots Magic is going to serve as home for "perfect tree." Well, as perfect as it can be anyway for the information I have. I have used Family Tree for the past ten years. It is not all sourced and "perfect" as it should be. I think we all start out like this. I have now decided it is time for my tree to be done as professional as possible! It has been awhile since I have shared anything regarding my first ever quilt I am making which will eventually become an heirloom, hopefully, for one of my ancestors. People have been asking to see pictures. So here is a bit of an update. This first picture shows when I started ripping out the borders. Yep I ripped them all out because the seams weren't the proper size. I then re-pinned and started again. Close to finishing with the borders. It went smooth this time except I was a little short on two of the colors and needed to buy more fabric. Once the borders were completed I cut the fabric (using my cutting mat from now on! lol) that is to be sewn in between the squares and laid it out on my floor. Now I am sewing the fabric that goes in between the squares on each row. The four rows are complete!